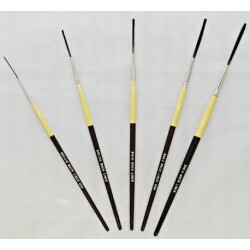 Mack Brush Series 840 Outliner Brushes, buy These brushes here, they are made with synthetic squirrel hair. This is a new synthetic that gives you the benefits of a natural haired brush. It is a soft hair that holds a lot of paint and gives you a good snap. Individual Brushes Listed BELOW! Mack brush outliner brush series 840 full set, sizes 0000, 00, 0, 2, 4. Rounded nickel ferrules. The 840 series out-liner brush is made with synthetic..
Outliner Brush Size 0 Series 840 Mack Brush Series 840 Size 0, Hair Length Out – 1-3/8", Nickel Ferrules. The 840 Series Out-liner brush is made with..
Outliner Brush Size 00 Series 840 by Mack Brush, Hair Length Out – 1-1/8", Nickel Ferrules. The 840 Series Out-liner brush is made with synthetic squi..
Outliner Brush Size 0000 Series 840 Mack Brush Series 840 Size 4/0, Hair Length Out - 1", Nickel Ferrules. The 840 Series Out-liner is made with synt..
Outliner Brush Size 2 Series 840 Mack Brush Series 840 Size 2, Hair Length Out – 1-5/8", Nickel Ferrules. The 840 Series Out-liner is made with synth..
Outliner Brush Size 4 Series 840 Mack Brush Series 840 Size 4, Hair Length Out – 1-3/4", Nickel Ferrules. The 840 Series Outliner is made with synthe..